Disillusioned with the materialism of Christmas, Santas gone on holiday, to as far from the North Pole as possible New Zealand! When his reindeerless-sleigh crashes and sinks in the waters of an idyllic holiday beach, he is found washed up by 8-year-old Sam and his 12-year-old si... read full description below. 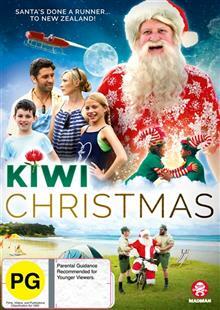 Santa's done a runner... to New Zealand! Disillusioned with the materialism of Christmas, Santas gone on holiday, to as far from the North Pole as possible New Zealand! When his reindeerless-sleigh crashes and sinks in the waters of an idyllic holiday beach, he is found washed up by 8-year-old Sam and his 12-year-old sister Molly and their newly separated parents. The family discovers who Santa really is and must unite to rescue him from the local Coastwatch who have set out to capture him, and convince him to return to the North Pole in time for Christmas Eve.